With nearly 300 members, representing 200 companies, ATD Puget Sound is the premier professional association for all things workplace learning and performance (WLP) and talent development. Our sponsorship program offers you an opportunity to show that your organization understands the value WLP and recognizes the role that this chapter provides to its members and the region in addressing ongoing professional growth and development. Sponsoring will provide your organization an increase in name recognition, an opportunity to build your network, and a channel to educate members about your services. 1. Chapter Annual Sponsor – Sponsor the Puget Sound Chapter for a year. 2. Chapter Meeting & Premier Event Sponsor – Sponsor a single chapter meeting or support one of our premier events or workshops. Our Chapter Meetings are held monthly on the third Tuesday and a minimum of two premier events are scheduled each year. 3. Employee Learning Week – Be part of the tradition of excellence and help raise awareness and support for Employee Learning Week through a wide variety of sponsorship activities. 4. In-Kind Sponsor – Provide our chapter with an item or service that we would otherwise have to purchase and receive recognition on our web page, newsletter and at a meeting. 5. Member Only Discounts – Provide discounts to our members in exchange for internal promotion of your product or service. 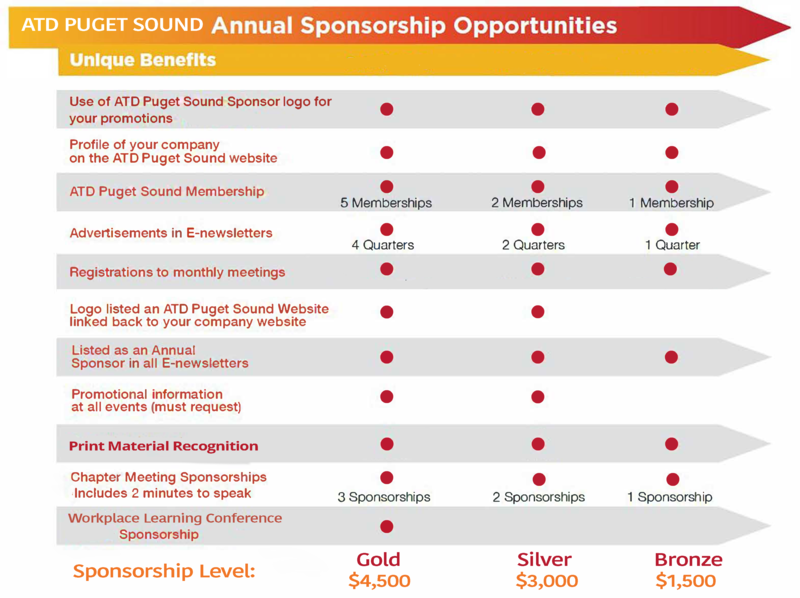 Are you looking to advertise and promote your event, product, or service to Puget Sound talent development professionals? We have multiple ways you can reach local professionals through sponsorship of our newsletter, website, and /or annual conference. Information within this page provides detail information on pricing and timings for advertising placement with our membership.